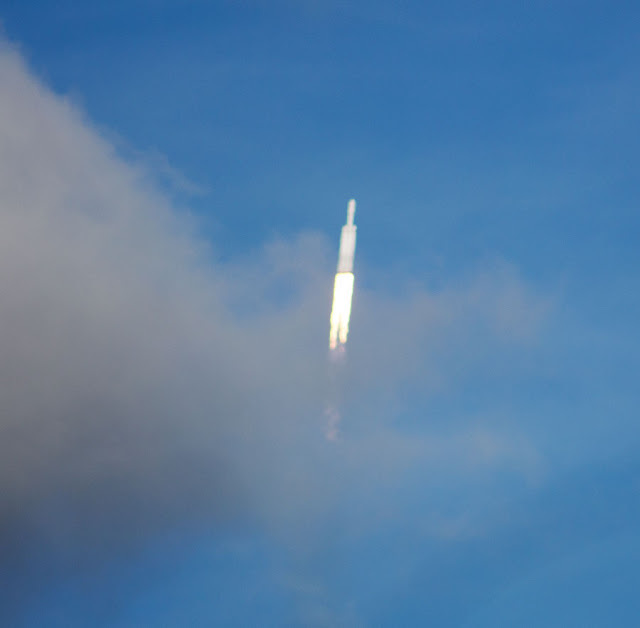 Palmia Observatory: Hooray, we experienced the Falcon Heavy launch at KSC; Keplerian Two Line Elements for Tesla Roadster; Fun in Cocoa Beach, but watch for gators! 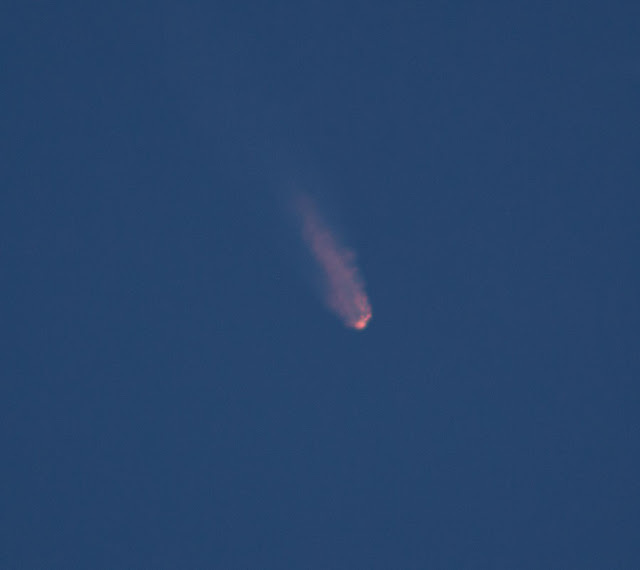 Hooray, we experienced the Falcon Heavy launch at KSC; Keplerian Two Line Elements for Tesla Roadster; Fun in Cocoa Beach, but watch for gators! 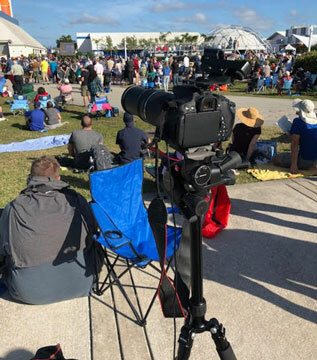 Well, we got our tickets for the "closer viewing site" at the Kennedy Space Center for the launch of the first SpaceX Falcon Heavy. We were too late to get tickets for the "feel the burn" site or the "closest viewing site", but all eventually went well and we have some photos to share. Resident Astronomer Peggy decided not to attend the launch, as she was worried about the effects of the noise, but I met up with OCA Science Nerds and Theatre Impresarios, Scott and Sandy, at LAX and we flew to Orlando and on to Cocoa Beach on Tuesday, in anticipation of the big launch on Wednesday. The traffic to and from Kennedy Space Center (KSC) was pretty bad, but I guess with something like a 100,000 folks lined up around the area to see the launch, things went fairly well. We had a great time and a lot of fun, so thanks for that, Scott and Sandy, and thanks to OCA Tom Munnecke for alerting us about the available tickets. The photo below shows my DSLR with 300mm lens and red dot finder on a Roadtrip Tripod, which conveniently folds up and fits inside airplane carry on luggage. Our "closer viewing" site was still 7.5 miles away from the launch pad and when the rocket finally lifted off, we could not see anything until the rocket cleared the trees in the foreground. At 7.5 miles away, even the sound of the rocket didn't make its appearance for us until about 36 seconds after ignition, which by that time the rocket was quite high in elevation from our viewing area. Once the crowd started to shout and point, I was able to bring the red dot to bear on the rocket and capture a couple of images before the elevation got to high. The image below is a little bit out of focus, but it was all there. I tried set the initial focus with a large building in the distance, but it was not anywhere as distant as the rocket. I tracked the rocket for another couple of minutes before I ran out of elevation range on my tripod head. There are two directions that the camera can be mounted on the tripod head and the way that I used was the one that has limited range in elevation and as the rocket kept going higher and higher in the sky, I ran out of range and couldn't adjust the knobs any more. In order to keep going, I actually just started to tip the whole tripod so that I could follow the rocket. Luckily I got the image below, which if I read off the camera clock correctly, is just a minute and 24 seconds after the first image above. The Falcon Heavy kept climbing higher and higher and I managed to get on more image just before I lost track of the rocket and couldn't see any thing. This image is just 12 seconds after the one above. So even after the rocket climbed out of sight, we knew that that was not the end of the show. Remember that one of SpaceX innovations used to achieve large reductions in the cost of space flight is to recover the rocket first stages and refurbish them and use them again. The Falcon Heavy is made up of three identical Falcon 9 rockets strapped together to make one vehicle. Each Falcon 9 rocket has nine separate engines, which means the Falcon Heavy has a total of 27 separate engines. After the first stage engines have used up most of their fuel, the two Falcon 9 booster rockets separate from the main Falcon 9 core, which continues its upward thrust. The two separated Falcon 9's then use their remaining fuel to return to the launch area and land upright, just like the rockets in the scifi movies in the 50's and 60's used to do. Unfortunately, the landing site where this occurred was too far away for us to see, but we did watch it happen on a big video screen that was set up for us to watch. It urned out that the two booster rockets landed successfully, but the main core Falcon 9 malfunctioned and did not land soft enough on the barge landing site and was lost. I also managed to snap a couple of cell phone pictures which surprisingly also turned out to be pretty neat. 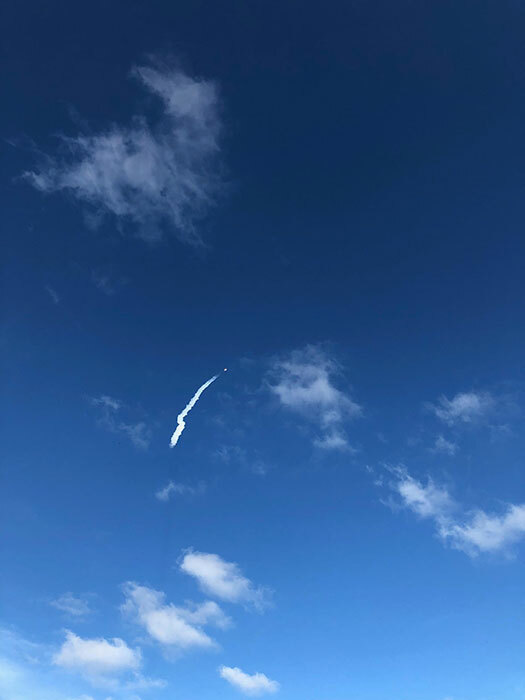 Check out this photo taken during the early part of the launch. 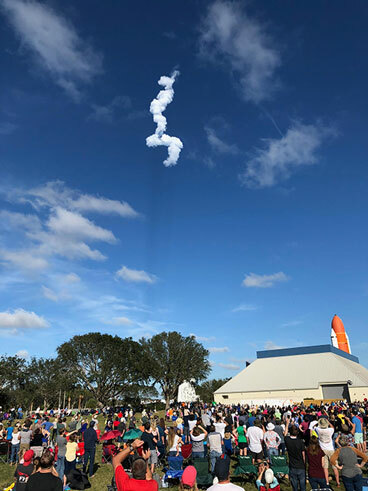 After the rocket was out of sight the exhaust contrails were still visible and they had been twisted into a contorted shape by the winds aloft. 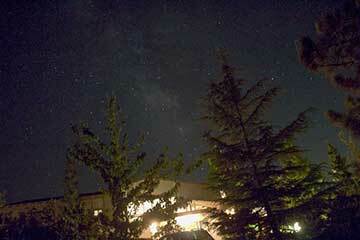 Sometime during this photo session the sounds of the rocket and very loud sonic booms happened. The sonic booms showed up, sometime grater than the nominal delay time of 36 seconds, between the visual sighting and the arrival of the sound. As you know from previous posts of this blog or just regular news channels, the Falcon Heavy carried a test payload of Elon's red Tesla Roadsters. It is out there in space on its journey around the sun in an orbit, close to Mars or the asteroid belt. While we were at the airport waiting to return to Orange County, I wondered if we might be able to actually see the Tesla as it goes along on its journey? Well, I can recall that several years ago I took a long exposure of some of the geostationary satellites in orbit and they could be seen in my small telescope as just a bright little dot. So would it be possible to see the Roadster too? Some website references put the visual magnitude of geostationary satellites in the 10-14 magnitude range, with sometimes being brighter than that depending on the satellite and sun orientation. It doesn't seem that the Tesla could appear as bright as a communication satellite, with all of its solar panels and antennas, but if it were could we see it? Hmm, it doesn't seem to likely, in that the escape velocity required for the Tesla to move away from the Earth's gravitational pull and escape is about 25,000 miles per hour. Now the geostationary satellites are about 22,200 miles above the Earth's surface, so each hour of travel would put the Tesla just a bit more than that distance away from us. So, just one day after launch, the Tesla would be so much further away from us that even if it started out just as bright as a geostationary satellite it would now appear to be about magnitude 2.5 log (24 * 25,000 / 22,200 )^2 = 7.1 dimmer. On each following day, the Tesla would get just a little bit dimmer still, nothing like the 7.1 magnitude dimmer on the first day, but it would continue to grow dim. Hmm, my guess is that since the Roadster probably is not as good a reflector as a communication satellite, and it will be much further away, we are not going to see it with any amateur scopes. But, just in case someone thinks it could be done, our friends at NORAD have provided the Keplerian orbital elements for the Tesla. The orbital elements are provided in what is called, Two line elements (TLE), and the current estimate as of today is shown below. With the latest version of the TLE in hand, and your current location and time, you can calculate where to point your telescope, and hopefully that pointed to location is in the night sky. I remember trying to do a similar calculation a couple of years ago and I don't remember enough to do the calculation again. If you want to try it yourself, like I did years ago, you can get out your old copy of "Orbital Mechanics for Engineering Students" by Howard Curtis. He does a pretty good job of explain the orbital elements and going over the algorithms to carry out this type of coordinate transformations needed to get from the current position along the orbit to where to point your telescope. Not wanting to break the good vacation feeling from our time in Florida, I am not going to get out my copy of the book, just now anyway. The events of the launch day were fantastic and it was a great experience and we all had a great time. The traffic jams were completely bearable given the high of the launch experience. 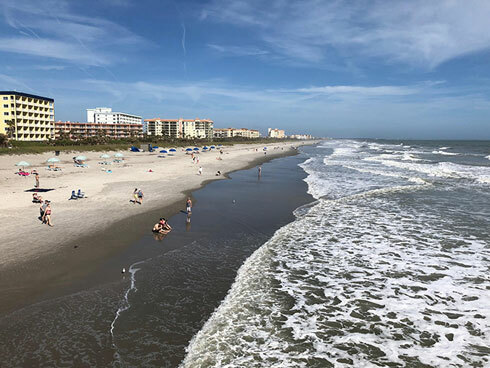 Now we had planned to stay another day in Cocoa beach, just in case the launch were to be delayed by one day but with the successful launch on day 1 of the schedule we had an extra free day to just relax and have fun. The ocean and beach along this area in Cocoa Beach, was just a couple of hundred feet from our hotel. We also had a chance to see some of the local inhabitants also. 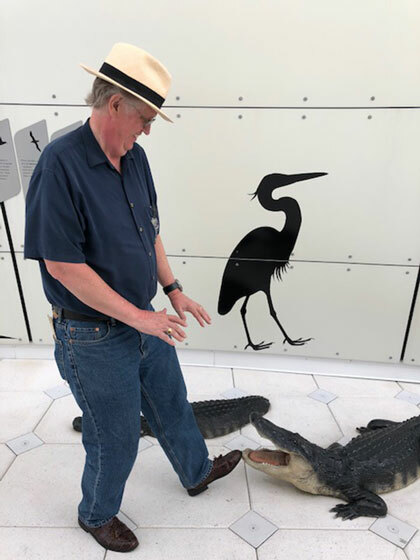 Well, ok, ok, at least my alligator shoes are real! So what will happen next? Elon and SpaceX will continue down the path of space exploration and launch cost reduction and we will continue making progress towards arriving on Mars. Even though Elon might be a billionaire, he is still many billions short of achieving his dream of getting to Mars. Maybe we need a lot more billionaires in the world! For the rest of us, we need to decide if we will choose to help. Maybe we will just be physicist wannabes or just be spectators and end up just as hooked on rocket launches as we have become on chasing total solar eclipses. © 2014 - 2019 Palmiaobservatory.com. Simple theme. Powered by Blogger.